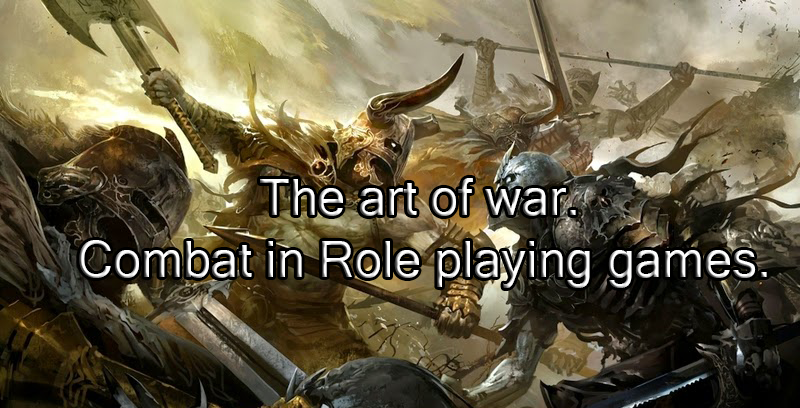 The art of war. Combat in Role Playing Games. | The DMs Blog. Advice, tips and insight from a veteran Dungeon Master. The art of war. Combat in Role Playing Games. Combat is a thrilling aspect of any Role Playing Game. Many players live for the thrill of the fight and enjoy it more than the actual Role Play itself. Rolling dice and seeing those desired numbers show face up, or landing those critical hits is exciting. Combat is however more than just rolling dice and having the numbers dictate the outcome. In this topic, we will look at how to make combat really come to life, and how to get the most out of those battle encounters. We will begin by looking at designing a good combat encounter. Firstly we need to ask ourselves why will this encounter result in a combat? If it is a simple ambush, well then you already know the answer, but many encounters can result in combat where they perhaps did not need too. When I have an overzealous party that tends to hit first and ask questions later, or who has problems keeping their ego in check, I often deploy an encounter I like to refer to as a “swing encounter”. The Gorebad swing encounter is basically one that can go either way depending on the attitudes of the characters. For example I recently used a rather grumpy and agitated Weretiger to do just this. The characters had begun to bully their way through encounters, and had started developing egos that were eventually going to result in them biting of more than they could chew. I saw this eventuality looming so I decided to drop in this Lycanthrope. Now Weretigers are typically true neutral in alignment, so their actions are largely situational and are dictated by other outside social triggers. The characters met him in human form, and he was (for reasons that would become clear later) viewing the characters with suspicion and was a little stand offish. I had decided that he would either help or hinder them depending on how they interacted with him. A positive interaction would win them a potential ally, while a negative one would land them in a tough combat situation. I did this to illustrate to the players how sometimes you just have to know when to not push back and hold your tongue. The players chose wisely and avoided combat. If this had become a combat encounter however, I would have had a clear understanding of how and why the fight took place, and as such would have known how my Non Player Character or monster (in this case the Weretiger) should act. The combat would have taken place in a wooded area, one that my Weretiger would have been very familiar with and one that my players would not. This being said I would have used the monsters knowledge of the terrain to his advantage. Also depending on how the combat was going he may well have retreated and possibly came back at a more advantageous time. Determining the motivations behind the combat is important in being able to run it with substance. Are the players the aggressors or the victims? Is it on either sides home turf? Do the Non Player Characters have strong motivations to stand their ground, or may they break and flee? Are reinforcements close by? etc. It is important to set the scene for the combat encounter also. Terrain and surroundings play an integral part in how a combat plays out. History tells us that three hundred Spartans held the narrow pass of Thermopylae for three days against tens of thousands. This was only achievable due to the location that the battle occurred. If they had met on an open battlefield it would have been a short and bloody massacre. Chapter ten of Sun Tzu’s the art of war discussed terrain and its effects on a battle. Indeed it enlightens us to how a battle can be won or lost based on where the battle takes place. This can and should be a factor in the combats in which your players find themselves in. Aspects such as height of terrain, difficulty of movement, items of cover, visibility and temperature all play a factor. Too many Dungeon Masters ignore this aspect of combat and allow combat to become a toe to toe turn based dice fest. Not every combat has to start and end in one encounter. Indeed many good battles play out over several encounters. Recently on Howreroll the players took three separate encounters to take down one particular Necromancer. Making what could have been a simple end boss encounter, a chase that lasted a couple of weeks in game time. It also made for a much more climactic showdown when they finally did corner and ultimately defeat him. After the first battle both the characters and the Necromancer knew a little of the others tactics, so the dynamic changed the second and third time they fought. And again this change in dynamic altered the combat substantially. A good reoccurring villain can be a great source for great combat encounters in this way. Either he manages to evade capture time and time again or the players may keep slipping through his fingers if he is the pursuer, but each encounter has epic potential, especially if used with correct timing, and not over done. The next thing we will look at is how to describe combat. Simply saying “you hit, you miss” is boring! I like to describe the combat step by step and blow by blow. Players love to hear the details of how the final blow dispatched their foe, or what the effect of a particular successful sword strike was. On our live Dungeons and Dragons show, I try to describe each and every hit, miss, crit and fumble. I keep the descriptions short, but I make sure they are imagined. My descriptions are dependent on the players actions and the outcome of the dice rolled. So for a narrow miss I may say something like, “you lunge with your long sword at the Orcs unprotected belly, but at the last minute he is able to bring his cleaver around and manages to narrowly deflect your blow to the side”. Or for a high damage hit that does over twenty five percent of the enemies hit points I may say, “your powerful overhead swing strikes the ogre and opens up a deep gash in his thigh. He glances at the open wound as the blood flows down his leg, and he takes a step back to reassess the situation. He no longer seems so eager to rush in”. I recently had a private message from one self proclaimed “veteran Dungeon Master” (of ten years) who told me that I should not describe the players blows and I should let them do it themselves. I totally disagree and here is why. Hit points are relative to the creature. Hitting a goblin for six damage may be an almost fatal blow, where as to a hill giant it is little more than a scratch. The players do not know how many hit points a particular enemy has, especially in relation to enemies with a class, so they are not effectively able to accurately describe the outcome of any given hit. That being said I am all for and encourage a player to tell me and describe what he is TRYING to do, but the outcome of his action is mine to explain. I also like to improvise advantages and disadvantages that may occur to one side or another during combat. If the players make a particularly high damaging hit on a monster, I may have it back of, and hold its attack that round, as it rethinks its strategy. Or I may have a high damaging blow drop the target to one knee, robbing him of part of his move action the next round. While these things may not be part of the combat mechanic, they add something to the combat that makes it feel more real. We just mentioned that we should encourage players to tell us what they are trying to do. I do not mean in them saying I attack the Troll, or I cast Magic Missile, no I mean describe how it is to happen. “I swing my broadsword with all my might at the Dire Boar” can be a descriptive way for a player to let you know he is using his power attack feat. Or a player who’s character is a bard may start singing an eighties power ballad and in doing so lets you know he is using his inspire courage ability. I like to encourage descriptive combat in my players also so I will often give bonuses or allow successful skill checks to infer combat bonuses. Here is an example of what I mean by that. A group of players are battling some pirates aboard a ship. One of them just finished of his adversary on the raised bridge of the ship and looks down and sees one of his comrades pressed by two cutlass wielding sea dogs. He knows if he runs down the stairs it will be two rounds before he can aid his friend so he asks “are there any ropes or anything I can use to swing down to the lower deck”. I like where this is going with this, so I tell him “YES, there is a rope within reach that is tied off on the rail behind you”. “OK” he replies, “I try to swing down on the rope and I want to try to slash at one of the pirates as I swing by”. In this situation I would have him make a skill check to swing down on the rope and a bad roll may land him in a compromising situation (or give him disadvantage in fifth edition Dungeons and Dragons rules) where as a good roll may have a bonus effect (or give advantage). Never be afraid to reward creativity in your players when it comes to combat. They will be more inclined to be descriptive and really get into the fight if their actions can change the outcome and make it more exciting. A prime example of some of this coming together can be seen here at minute 42.30. During this episode of the Marks of intrigue, a bar fight breaks out and all manner of improvised attacks and terrain come into play. Finally lets look at mortality in combat. When two groups of people engage each other with weapons and magic, people have a tendency to die. While it is common for the monsters and some Non Player Characters to bite the dust, it is a much bigger deal and less common when it happens to a Player Character. With this in mind what is a Dungeon Master to do when he confronts the players with a fair challenge and due to their poor dice rolls and his good rolls the players are loosing to a band of goblins that they should easily be able to defeat. Well this really comes down to your individual style of Dungeon Mastering. many Dungeon Masters will tell you that they will modify a few of their own dice rolls (behind the Dungeon Masters screen), to balance this. Others will tell you that they do not baby their players, and the dice can be a cruel mistress to all equally at times and it is down to the players to retreat from a fight that is going badly for them (assuming they have the option). I have my own views on this and they alter a little depending on who I am playing with. With a die hard experienced group of players, sometimes I roll openly and let the dice fall as they may regardless. Other times I may fudge a roll here or their to be lenient to a newer group of players. Regardless I always allow dice to fall where they may during epic encounters or if the players put themselves in harms way through stupidity, despite fair warning. To me it comes down to trust. The players must trust you as their Dungeon Master to be fair and treat them with consistency and equality. As long as you achieve this I am not going to berate you for your choices. My goal is always to strive for open rolls but I also realize from time to time this can add to much of a random element to something that should be less so. Combat is not the be all and end all of Role Playing, but it is a fun and integral part of any system. Taking steps to bring it to life and make it believable, is just as important as the work you put in to develop a viable world for your players to explore. There is so much more I could say about combat, but rather than lengthen this topic any farther I will just leave you with this. < Previous Controlling your Emotions in a Role Playing Game. Next > The one when the Paladin died twice! Pingback: Describing your actions in Role Playing Games. | The DMs Blog. Describing your actions in Role Playing Games. The Loner/outsider character. Why and why not. Lazy Players (how not to be one). How to be a better DM.